With the growth of global business, the need for air travel has become extremely imperative for affluent people in the business world. With the increase of costs for charter flights and flight cards, purchasing a personal aircraft is becoming more popular than ever. Some affluent business people spend almost as much time in the air as they do on the ground, and high-end private jets serve as a second home. For those in need of a comfortable ride through the air, we have the Airbus A380. The Airbus A380 is considered one of the largest, best aircrafts for international travel for commercial flying. The double decked aircraft boasts all of the newest technologies an airline looks for to provide the best flying experience for their passengers. You receive incredible amounts of spaced mixed with the highest quality of technologies. The cabin has a ceiling 20% higher than the average airliner at 7.64 feet high. The air inside is recycled every three minutes to guarantee a perfect climate. Advanced lighting systems are standard and can be adjusted manually or automatically according to the time of day to ensure complete comfort. We could list off an absurd number of dimensions to help you understand the incredible size of this jet, but just to put it into perspective, a first class commercial version of the jet holds 525 passengers. That size will equip every one of those passengers with their own space, bed and television. 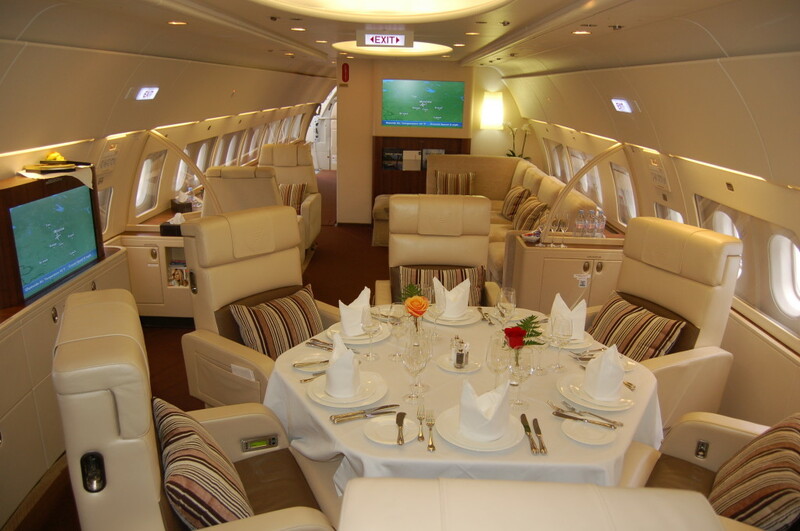 Transforming this jet into your very own private or corporate jet would provide the best flying experience possible. The A380 is a well known aircraft for its advanced technology and flight capabilities. The ride on this aircraft is nearly always smooth, and has the capability to travel up to 15,700 km in one flight; that’s almost half way around the earth at the equator. The plane is powered by four Rolls-Royce Trent 900 engines that produce up to 70,000 lb-slst. Big names have taken notice of this jet and its capabilities, including Prince Alwaleed Bin Talal, who purchased a private “castle in the sky” for an eye popping $500 million. The A380 the Prince purchased was built from the ground up with dozens of unique features, such as a conference room with a holographic display on a conference table. While leather upholstery, couches, chairs and beds are standard, you can always have it gutted and customized however you’d like. For those who want the basic corporate level A380, your price will be starting at $300 million, and you’ll have enough bedrooms and space to comfortably house 50 people all the way from Chicago to Tokyo. Contact Airbus to get your own and arrange to have one personalized to be fit for a Prince. To get an idea of the amazing flight capabilities of the A380, enjoy this YouTube video from Cargospotter below, where it does a vertical take-off followed by a short air show.